He never expected to get rich from it. He never expected to get famous from it. Music has never been about anything other than “doing your own thing,” in the mind and fingertips of bluesman Paul Plumeri. Plumeri has been doing his thing for decades, stemming back to high school when he started to develop his own tone in style instead of mimicking others. ‘Crossroads’ exactly as it was played,” Plumeri jokes in his online biography. “I would stylize it; I could sound like the player somewhat, but just couldn’t do the note-for-note thing,” he adds. Over the years, it’s that kind of approach that led Plumeri to embrace and showcase his own blues sound — little traditional elements are scattered across his songs, but the product is hotter, louder and more electrified. Tonight, Plumeri and his band are taking stage at the Bordentown Record Collector, where they plan to show off what makes them different. But you don’t have to wait to hear it to believe it. Sample his self-produced album, “Bishop of the Blues,” to get an idea. Somewhat similar in his style to guitarist T-Bone Walker, Plumeri strays when he holds back notes instead of adding them. 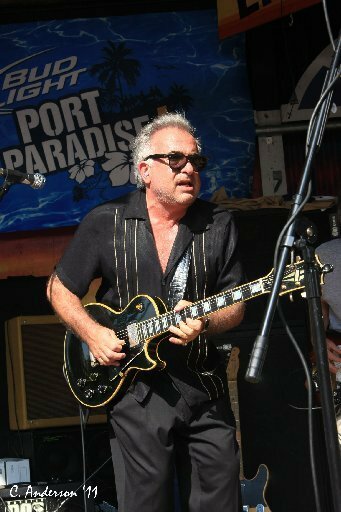 That distinction has kept Plumeri in the Garden State and Philadelphia music circuit for decades, even when listeners began leaving their blues behind in the '80s. Plumeri still did his thing, touring night clubs and music festivals with his backing group, and pleasing those who weren’t as interested in what was happening at the top of the charts. While there, be sure to check out “The Glide,” “The Boogie” and “Hey Joe.” You can also check out his history and upcoming shows. This is an all-ages show. For more information, log onto the-record-collector.com. All tickets purchased online or by phone will be held at the Record Collector Box Office until doors open at 7:30. Paul Plumeri and his band perform tonight at the Bordentown Record Collector.